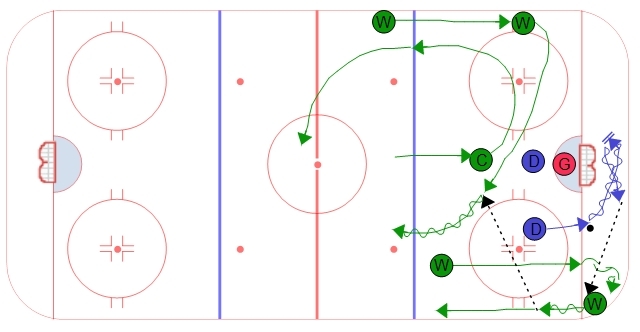 This purpose of this breakout is to reverse the flow to the weak side of the ice away from the forecheck. The defense initiates the play by "wheeling" behind the net. They need to gain the far post and then stop and pass back to the weak side wing who has dropped down low for support. The center should swing as though the slot as diagramed and fly out of the zone. This should keep the opponent's defense off the blue line. The far side wing swings low through the slot to support the wing with the puck. The timing of the wing is key, they should provide support so they can receive a horizontal pass as they skate through the slot.